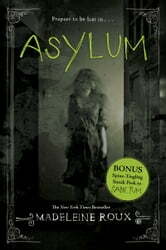 Madeleine Roux's New York Times bestselling Asylum is a thrilling and creepy photo-illustrated novel that Publishers Weekly called "a strong YA debut that reveals the enduring impact of buried trauma on a place." Featuring found photographs from real asylums and filled with chilling mystery and page-turning suspense, Asylum is a horror story that treads the line between genius and insanity, perfect for fans of Miss Peregrine's Home for Peculiar Children. Don't miss Madeleine Roux's all-new shivery fantasy series, House of Furies. I didn't hate this book, yet I did not love it either. I loved the altered photos, the cover, the chapter pages, all beautiful. I found the story to be incredibly simple, but that not a bad thing. This is not meant to be the next great piece of literature, its meant to entertain and scare and take you away. those are where my issues came in. I found the setting wonderfully done, the building captured in words perfectly. However there were some areas that felt forced, like those passages were forced around a photo rather then finding the right photo to fit the passage. I also had difficulty connecting with the characters. I think the story just needed to be more fleshed out, a little more fully realized. Really just longer. but still a good way to spend a couple hours. My Review: Dan Crawford is a 16 year old boy is attending the New Hampshire College Prep summer program. Although for Dan, it’s a little more than just that. At his high school, Dan is an outcast, and he’s hoping that this summer, being in a brand new place, will allow for him to make friends before he starts college. However, when he arrives on campus, Dan learns that the dorms he is being housed in all summer used to be an old asylum. A last resort for the criminally insane, a place where bad things happened. As Dan and his new friends, Abby and Jordan explore the hidden parts of the dorms, they will soon discover that it’s no coincidence all 3 of them ended up there, for the asylum holds a key to a very terrifying past. WOW! I loved this book! I had a very hard time putting it down! For me, it was a total page turner, and I just had to see what was coming next. I live maybe 30 miles from the Trans-Allegheny Lunatic Asylum, and have always let my mind wonder about the place. So this definitely up my alley. It has ghosts, mystery, a touch of romance, and old hidden secrets. This is one of the best books to set up for a spooky feeling or a great read for Halloween. The book moved at a great pace, not too fast nor too slow. There was just enough air of mystery to keep me turning the pages, and enough romance, that it didn’t overpower the rest of the story. Of course, I loved the photos throughout the book, if anything, there could of been more (again I’m just drawn to that stuff because of TALA). I think I finished this within a week, and went of over the weekend and got the 2nd book. I’m very excited to see where these characters are now, how they have changed (if any) from their time spent at Brookline, and what other terrors await them. I only had one problem with the book: How exactly did Jordan fit into the secrets of Brookline? The way the jacket read, Abby, Dan, and Jordan were tied in someway by the asylum, but unless I overlooked this, there was no explanation. With that being said, the book took a turn I never saw coming, and it ended in a way I would have ever expected. I just wished the book would’ve talked a little bit more with the aftermath of Felix, and and dug a little deeper into Dan’s family history. But, hopefully the next book will fill in a little bit of those gaps. Now, there are a lot of negative reviews for this book out there. Which is totally cool, everyone is entitled to their opinions. However, a lot of them state this book is great for fans of Miss Peregrine’s Home for Peculiar Children, which some readers feel it is not. I have to agree, I’ve read the book, but actually didn’t care for it, so maybe that’s where the problem comes from. The only similarity is the old pictures. But regardless if you are a fan of Miss Peregrine or not, this shouldn’t be compared, the only way to decide is to read! Positive Elements: Despite some of Dan’s “issues” he makes quick friends with both Abby and Jordan. Dan has had a pretty tough life, but he loves the family who adopted him and he wouldn’t trade them for the world. Negative Elements: There are swear words throughout this book. Of course, Dan, Abby, and Jordan sneaking into the old office. Jordan did some underage drinking for a page or so, because he got upset with Dan and Abby. Naked girls and boys are mentioned as being in Abby’s drawing class. Spiritual Elements: Ghosts are brought up a lot, with being in an old asylum and all. God’s name is misused several times, and Jordan mentioned praying to many gods. Dan suspects a pastor of a heinous crime. Other Thoughts: Let’s not forget the fact that the author references Doctor Who! I was so pleased with this book, and I can’t wait to being reading the second! Could not think of a better book, page Turner, I think a movie out of this story would be terrifying. Love love the pictures makes everything seem much real. Great job to the team, editors and you Mrs Roux for such a great read. Loved this book but I think I'll probably be sleeping with the lights on for a while. Hope there's another one coming to finish the story.